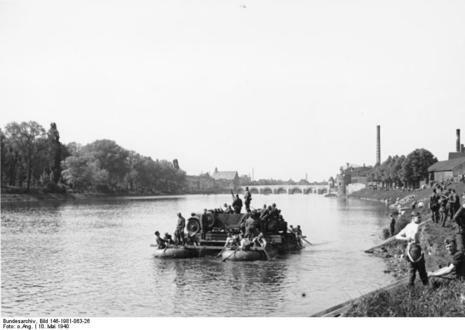 The Battle of Maastricht was one of the first battles that took place during the German Campaign on the Western Front. 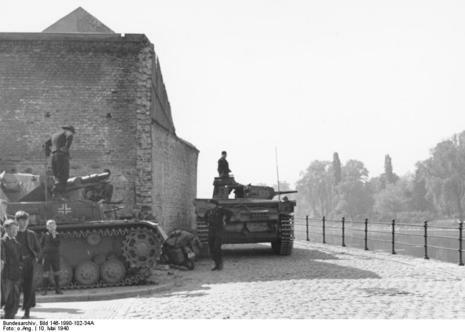 Maastricht was a key city in order to capture the Belgian Fort Eben-Emael and split the allied armies in half. The German goal of the operation was to take the bridges over the river Maas intact, in order to have an easier road to France. Therefore the Germans sent in civil teams whose jobs were to sabotage the bridge charges. However, they were spotted and arrested, and when they attempted to run, shot down. The siege of the bridges at Maastricht was closely connected to the daring plan to raid the Belgian super fortress Eben-Emael, only some clicks southwest of Maastricht. This fortress - considered a very important Belgian strong-hold - controlled a large part of the Albertcanal, Maas and four bridges. With this fortress intact the 4th Tank Division could end up in a very delicate situation.